For Bering Sea Service deck are protected by watertight doors. The efficiency of the Birgit-N's design is enhanced by the use of two 10-ton cranes, both fabri- cated by Northern Line Machine, a division of Tacoma Boat. The forward crane has a reach of 36 feet, and will serve as the picking boom. The aft crane is a unique level luffing design with a reach of 48 feet. The level luffing fea- ture of this crane allows the op- erator to raise and extend the boom without the need to con- stantly pay out or haul in line. No matter how the boom is ma- nipulated, the line length remains fixed. This arrangement is safer, faster, and more precise than ex- isting installations. Both cranes are controlled by hydraulic servos on the main control valves which are located in the engine room. The newly christened fishing vessel Birgit-N is the first crab- ber/trawler built by Tacoma Boat- building Co., Inc., Tacoma, Wash., for service in the Bering Sea. Inc. for Peter Njardvik and A.O. Nordheim to join their other ves- sels in the rigorous and highly competitive Bering Sea crab fish- ery. The design, by B.F. Jensen and Associates, incorporates sev- eral features improving the effi- ciency of the vessel. The Birgit-N has four crab tanks, each tank being insulated with 6 inches of closed cell ure- thane foam. The four-tank ar- rangement allows for ease of load- ing crab, and also facilitates han- dling of salmon when the vessel acts as a tender during the Alas- kan salmon season. A 60-ton re- frigeration plant is installed to maintain fish in the tanks at a temperature of 30F in chilled seawater. Sumps located in the forward tanks and a sliding wa- tertight door between tanks will allow rapid discharge of the fro- zen salmon via a fish elevator through the forward tank hatches. A major benefit of the four- tank arrangement is a shaft alley allowing access from the engine room to the steering compart- ment and lazarette below decks. Electric Power 2 Caterpillar 3406 with 210-kw Generators; 1 Caterpillar 3304 with 90-kw Generator. Cranes: 1 Telescoping; 1 Level Luffing "Knuckle" Boom. ramp, and a Northern Line net reel to allow the Birgit-N to trawl for bait fish. Ltd., Oakland, Calif. His respon- sibilities include overseeing all engineering design and construc- tion of vessels, facilities and equipment. The announcement was made by Henry Kozlowski, senior vice president, Planning and Control. Mr. Pentimonti joined Ameri- can Mail Line (which subsequent- ly merged into APL) in 1972. He has served as director of engi- neering for APL since 1973, con- centrating on the engineering as- pects of the company's shift to containerization in the early 70s. 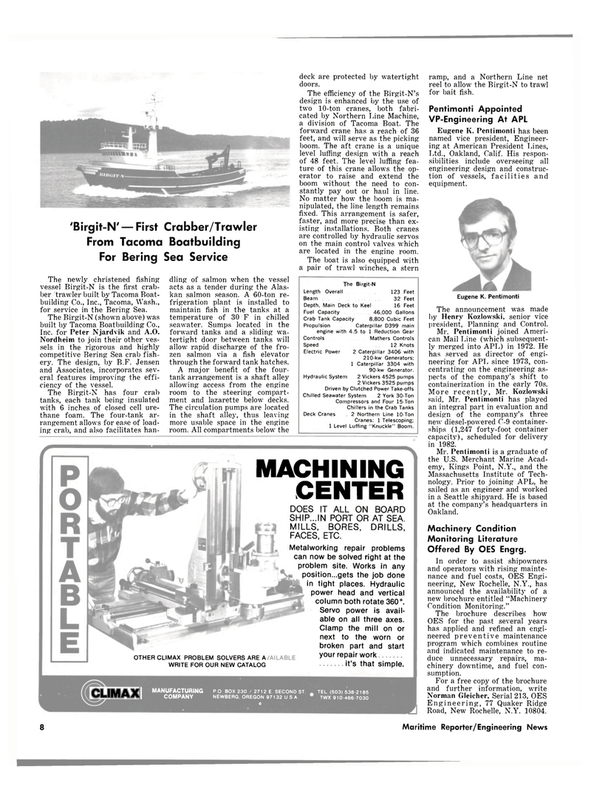 More recently, Mr. Kozlowski said, Mr. Pentimonti has played an integral part in evaluation and design of the company's three new diesel-powered C-9 container- ships (1,247 forty-foot container capacitv), scheduled for delivery in 1982. OES for the past several years has applied and refined an engi- neered preventive maintenance program which combines routine and indicated maintenance to re- duce unnecessary repairs, ma- chinery downtime, and fuel con- sumption. Road, New Rochelle, N.Y. 10804. SHIP...IN PORT OR AT SEA. Metalworking repair problems can now be solved right at the problem site. Works in any position...gets the job done in tight places. Hydraulic power head and vertical column both rotate 360°. Servo power is avail- able on all three axes. Clamp the mill on or next to the worn or broken part and start your repair work it's that simple.